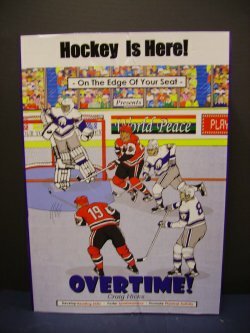 This kit is designed for libraries and elementary schools, using the exciting hockey picture book story 'Overtime'. This story visually portrays exciting play-by-play action creating the drama and thrill of a live game. The children have front row seats to this thrilling game and will not leave until that winning goal is scored. The spirit of teamwork, the essence of fair play, the value of hard work, and the virtue of sportsmanship are woven throughout the story. This Kit includes a color display/storage box that contains the following: 1 hardcover 'big book' (56 pages; 450x300mm) designed for shared reading; 10 perfect bound copies (56 pages; 215x280mm) for group reading and circulation; 1 reproducible activity book (48 pages) for follow-up literacy activities; and, 1 full-color poster.